If You Don’t Know About Sega Forever Series – Sega Every Month Brings A New Classic Game On Android In This Line-Up. Previously, It Was “Sonic The Hedgehog 2 Classic” And Now “Streets Of Rage Classic. It Is A Street Fighting, Side-Scrolling Beat ’em Up Game In Which You Defeat Enemies And You Have Limited Time To Clear The Wave. You Play As Adam, Axel, And Blaze. Each Character’s Control System Is Different – For Jump, Power, And Speed. You Can Play Solo Or With One Of Your Friend On Local Wi-Fi. 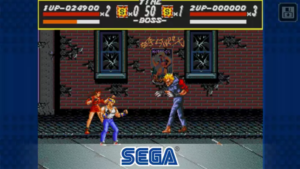 Like Other Sega’s Classic Games, Streets Of Rage Classic Also Comes With Two Modes – Play Free With Ad-Support Or Ad-Free Via In-App-Purchase. This Game Is Perfect, Runs Smoothly, And The Soundtrack Is Superb!! You Break Machines To Get Weapons And Use Them To Slay Down Your Enemies. At The End Of Each Round, You Fight With A Powerful Enemy. Total Of Eight Fast-Paced Rounds Are Featured In This Game. If You Love Classic Games Then You Should Play Streets Of Rage Classic. Price – Free[Contains Ads, In-App Purchase]. Size – 40 MB. Download – Here[Google Play Store].